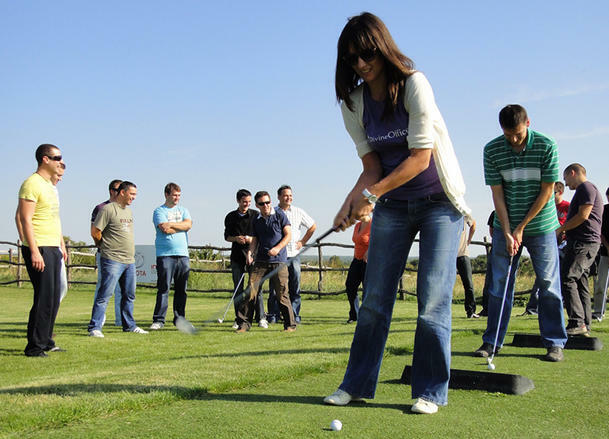 Pop-quiz: Where can you listen to high-level Magento development lectures, experience amazing cuisine that caters to vegetarians and meatlovers alike, and then swing away on the golf course for as long as you can – all in the same day? The answer is clear – only at Inchoo Learning Day! This traditional event took place for the third time in its brief (but already famous) history last Friday, with all the Inchooers leaving behind the comfort of the office chairs and their favorite coffee maker to change the scenery for a while. Inchoo Learning Day is a day when we move away not only from our office, but leave the city altogether and take refuge somewhere in the middle of Baranja, a small but beautiful area just north of Osijek. ILD combines brief, straight-to-the-point lectures (where we share some of the recent projects and know-how among the teams) with some outdoor activities of moderate difficulty (this is software development company after all). So, let’s take a closer look at what was going on last Friday. Tomislav started by taking us on a journey through the first three years of Inchoo, with an eye out on the plans for 2012 and beyond, and was later joined by our CTO Branko Ajzele who spoke about his new role in the team. During the presentation the new team members were surprised to learn how some of their colleagues looked very differently only three years ago. Darko, who many of our loyal readers recognize as The Symfony Guy, explained what this framework is all about. As a member of products team, he also joined Ivan to present one of their recent projects – the Divine Office Hub. The Magento part of the lectures saw another Ivan (Weiler) demystify Magento payment gateways, while Tomas gave everyone some insights into some advanced caching techniques – all of you Magento developers out there know just how important these topics are. At the same time, Toni and I were checking out a trial version of Salesforce as we’re considering using it as a new CRM solution, and the products team joined forces with our Italian guest Mauro Dalu to iron out some plans for the future. So, it was an eventful first half of the day, but we were eager to bid farewell to the first venue and drive towards the “main event”, which is just one of the many names developers use for “lunch”. For the second part of ILD we moved to Golf & Country Club Zmajevac – yes, there is actually a golf club very near Osijek. After enjoying a great lunch, which was a very traditional meal rather unique in these parts of the world – roasted lamb under a bell (vegetarians also had something really nice on their plates, but who actually paid attention?) – check it out. Afterwards we decided to step completely out of our comfort zone and take our chances at a very atypical sport for everyone – golf. There are actually only five holes on this course, but the thing we were aiming for was the driving range – and that’s where all hell broke loose. Now, you’ve probably heard of some guys called Jack Nicklaus and Tiger Woods, but Tomas Novoselic, Stanislav Mihic and Ana Gabric are some of the names you’ll be hearing a lot about in the future, if they decide to pursue a new career – we’ve seen some real rough diamonds out there. As for the others, well, we have to be honest – balls were flying around, moles were under some heavy artillery, and, most importantly, everyone laughed their socks off. We have enough footage for a season-long of bloopers on the Golf Channel (you can actually expect to see these on InchooTV), but we also witnessed some really nice long drives from our developers. You can check out the pictures from this ILD on Tomislav’s Flickr Photostream or check out #ILD3 hashtag from your Twitter. Really great photos in Flickr! Is it possible to share slide show somehow?